Well, hello! 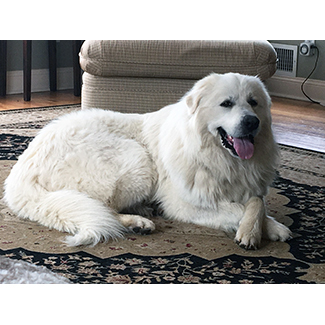 I am Casper, the friendly Pyr! 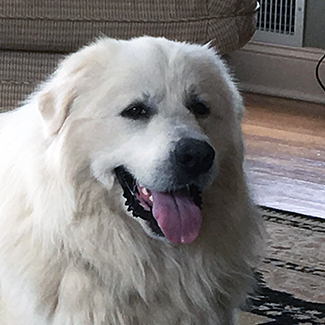 I am 2 years old and 96 lbs of smiling fluff. I had a family that took me in after a really bad person threw me out of a moving vehicle. They took good care of me and tried to get a big guy like me to fit in with all of their little pups. It didn’t take long for them to realize that I needed more room to run and play for me to be happy. I’m still smiling. I am a little shy at first but I am working on meeting more people and learning to trust them. I am good with other dogs but don’t always understand when they want me to stop playing. I love kids! They smile and are happy just like I am. I am learning how to get in the car without being scared and all kinds of other new things! I am learning about a leash and going for walks! I am good in the house and discovered those comfy things they call couches. Oh, I do like couches! I can’t wait to meet MY own family that will teach me all of the things that I need to know, especially that being home, is the best place you can be. 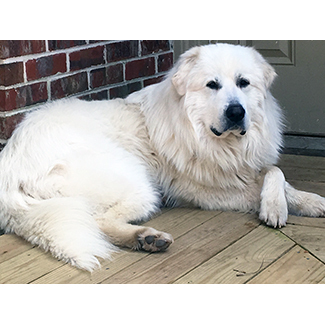 Contact GPRA to learn more about me at info@greatpyratlanta.com.